The Lenovo ThinkSystem SN850 is a four-socket Intel Xeon processor-based server that is optimized for high-end virtualization, mainstream database deployments, and memory-intensive, high-performance environments. The blade server incorporates Intel Xeon Processor Scalable Family of processors. The processors feature up to 28 cores each and use Lenovo TruDDR4 Memory, which runs at speeds up to 2666 MHz. This product guide provides essential information to understand the SN850 offering, its key features and specifications, components and options, and configuration guidelines. This guide is intended for technical specialists, sales specialists, sales engineers, IT architects, and other IT professionals who want to learn more about the SN850 compute node and consider its use in IT solutions. The Lenovo ThinkSystem SN850 is a high-performance server that offers enhanced security, efficiency, and reliability features to handle business-critical workloads. The blade server incorporates up to four Intel Xeon Processor Scalable Family of processors. The processors feature up to 28 cores each and use Lenovo TruDDR4 memory, which runs at speeds up to 2666 MHz. Suggested uses: large database, virtualization, enterprise applications, HPC, and cloud applications. The SN850 server uses Intel Xeon Scalable Gold and Platinum processors and memory can now operate at speeds up to 2666 MHz. It also includes the next generation UEFI-based Lenovo XClarity Provisioning Manager for rapid system setup and diagnosis, and Lenovo XClarity Controller management processor for systems management and alerting. This section describes the key features of the server. 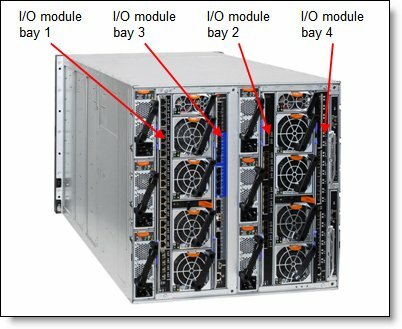 Up to 7 SN850 servers can be installed in one Flex System Enterprise chassis. Improves productivity by offering superior system performance with up to 28-core processors, 38.5 MB of L3 cache, up to three 10.4 GT/s Ultra Path Interconnect links and a Thermal Design Power (TDP) rating of up to 165W. Intelligent and adaptive system performance with energy-efficient Intel Turbo Boost Technology allows CPU cores to run at maximum speeds during peak workloads by temporarily going beyond processor TDP. Intel Advanced Vector Extensions 512 (AVX-512) enable acceleration of enterprise-class workloads, such as databases and enterprise resource planning. Each processor has 6 memory channels with up 2 two DIMMs per channel running at up to 2666 MHz. Up to 3.0 TB using 48x 64 GB LRDIMMs (all processors) or 6.0 TB using 48x 128 GB 3DS RDIMMs (requires M-suffix processors). 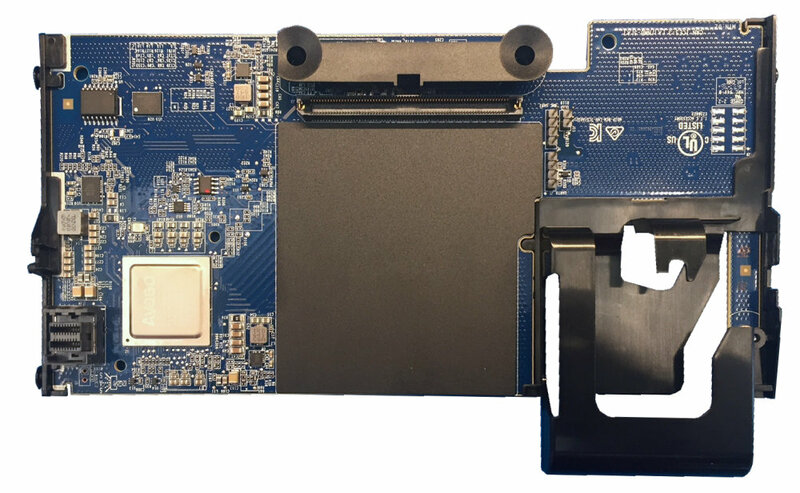 Embedded 4-port 10Gb Intel adapter built into the system board is based on the Intel Ethernet Connection X722 network controller. With Intel Integrated I/O Technology, the PCI Express 3.0 controller is integrated into the Intel Xeon processor Scalable family. This integration helps to dramatically reduce I/O latency and increase overall system performance. Support for high-bandwidth I/O adapters; up to four in each SN850 server. Support for 40 Gb Ethernet, 16 Gb Fibre Channel, and FDR InfiniBand. High-speed USB 3.0 port for connectivity to external devices. Hot-swap drives support integrated RAID-1 redundancy for data protection and greater system up-time. Solid-state drives (SSDs), which offer significantly better reliability than mechanical HDDs for greater uptime. The power source independent light path diagnostics functionality provides individual LEDs that lead the technician to failed (or failing) components, which simplifies servicing, speeds up problem resolution, and helps improve system availability. 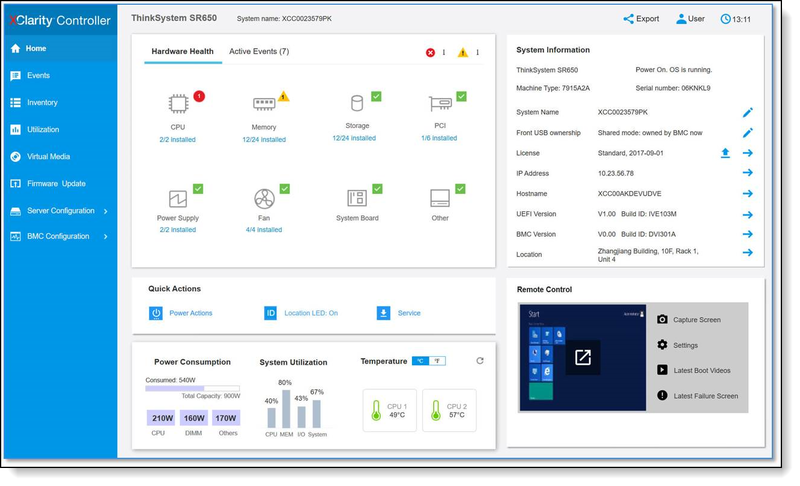 Proactive Platform Alerts (including PFA and SMART alerts): Processors, voltage regulators, memory, internal storage (SAS/SATA HDDs and SSDs, NVMe SSDs, flash storage adapters), RAID controllers, and server ambient and sub-component temperatures. Alerts can be surfaced through the system XClarity Controller to managers such as Lenovo XClarity Administrator, VMware vCenter, and Microsoft System Center. These proactive alerts let you take appropriate actions in advance of possible failure, thereby increasing server uptime and application availability. Built-in diagnostics in UEFI, using Lenovo XClarity Provisioning Manager, speed up troubleshooting tasks to reduce service time, and supports diagnostic function and to collect service data to USB key drive or remote CIFS share folder. Auto-restart in the event of a momentary loss of AC power (based on power policy setting in the XClarity Controller service processor). Three-year customer replaceable unit and on-site limited warranty; next business day 9x5. Optional service upgrades are available. Support for Lenovo XClarity Administrator, providing auto-discovery, inventory tracking, monitoring, policy-based firmware updates, address pool management, configuration patterns and operating system installation. The server includes an XClarity Controller (XCC) to monitor server availability and perform remote management. XCC Advanced is supported as standard, which enables remote KVM, mounting of remote media files (ISO and IMG image files), boot capture, and power capping. Supports Secure Boot to ensure only a digitally signed operating system can be used. Supported with HDDs and SSDs as well as M.2 drives. Intel Trusted Execution Technology provides enhanced security through hardware-based resistance to malicious software attacks, which allows an application to run in its own isolated space that is protected from all other software that is running on a system. The component-sharing design of the Flex System chassis provides ultimate power and cooling savings. The Intel Xeon Processor Scalable Family of processors offer significantly better performance than previous generations of processors, while fitting into the same TDP limits. Intel Intelligent Power Capability powers individual processor elements on and off as needed, which reduces power draw. Solid state drives (SSDs) use as much as 80% less power than traditional spinning 2.5-inch HDDs. The SN850 uses hexagonal ventilation holes which can be grouped more densely than round holes, providing more efficient airflow through the system. Figure 3 shows the locations of key components inside the server. The following figure shows the architectural block diagram of the SN850, showing the major components and their connections. Form factor Double-width Flex System compute node. Chassis support Flex System Enterprise Chassis with CMM2. Processor Up to four Intel Xeon processor Scalable product family CPUs: from 4 cores to 28 cores; core speeds from 1.7 GHz to 3.6 GHz; up to 38.5 MB L3 cache. Up to 3 UPI links with up to 10.4 GT/s each (processor dependent). Up to 2666 MHz memory speed. Up to 48 DIMM sockets (12 DIMMs on 6 channels per processor) supporting Lenovo TruDDR4 DIMMs at up to 2666 MHz. RDIMMs, LRDIMMs and 3DS RDIMMs are supported, but memory types cannot be intermixed. Disk drive bays Four 2.5-inch hot-swap SAS/SATA drive bays that support SAS, SATA, and SSDs. Optional support for four 2.5-inch NVMe PCIe SSDs. With four 2.5-inch hot-swap drives: Up to 61.44 TB using 4x 15.36TB 2.5-inch SAS SSDs or up to 8 TB using 4x 2 TB NL SAS HDDs. With four 2.5-inch NVMe SSDs: Up to 15.4 TB using 4x 3.84 TB PCIe 2.5-inch SSDs. With two internal Non-Hot-Swap M.2: Up to 256 GB using 2x 128 GB SATA SSDs. No support for the Flex System Storage Expansion Node. RAID support RAID-0, RAID-1, RAID-5 and RAID-10 with integrated Intel RSTe controller and optional Basic RAID 530-4i controller; RAID-0, RAID-1, RAID-5, RAID-6 and RAID-10 with optional Advanced RAID 930-4i controller. interfaces Integrated Intel 10 GbE; optional 1 Gb, 10 GbE, or 40 GbE adapters. slots Four I/O connectors for adapters. PCI Express 3.0 x16 interface. No support for the Flex System PCIe Expansion Node. Ports Front: One USB 3.0 port and one console breakout cable port that provides local KVM and serial ports (cable standard with chassis; more cables optional). Systems management UEFI, Lenovo XClarity Controller with Pilot4 XE401 baseboard management controller (BMC), Predictive Failure Analysis, light path diagnostics panel, automatic server restart, remote presence. Support for Lenovo XClarity Administrator and Lenovo XClarity Energy Manager. Security features Power-on password, administrator's password, Trusted Platform Module (TPM) 1.2 and 2.0, Trusted Cryptographic Module (TCM) - China only. Video G200 graphics with 16 MB memory and 2D hardware accelerator, integrated into the XClarity Controller. Maximum resolution is 1920x1200 32bpp at 60Hz. Limited warranty Three-year customer-replaceable unit and on-site limited warranty with 9x5/NBD. Dimensions Width: 435 mm (17.1 inches), height 55 mm (2.2 inches), depth 493 mm (19.4 inches). Weight Maximum configuration: 12.3 kg (27 lb). SN850 server models are country-specific; that is, each country may define their own server models, and not all server models are available in every country. This section lists the available models. Information on the models is also available on the PSREF website, http://psref.lenovo.com. The following table lists the base CTO models. The following table lists the base chassis choices for CTO configurations. * Models with 4x10GbE include a Fabric Connector which routes the embedded X722 10Gb Ethernet controller to I/O slot 3. Models without networking ("Open") can add a Fabric Connector using part number 7M27A03927. The Fabric Connector precludes the use of an I/O adapter in slot 3. The SN850 server is supported in the Flex System chassis as listed in the following table. The SN850 supports the Intel Xeon Processor Scalable Family options that are listed in the following table. The server supports two or four processors. 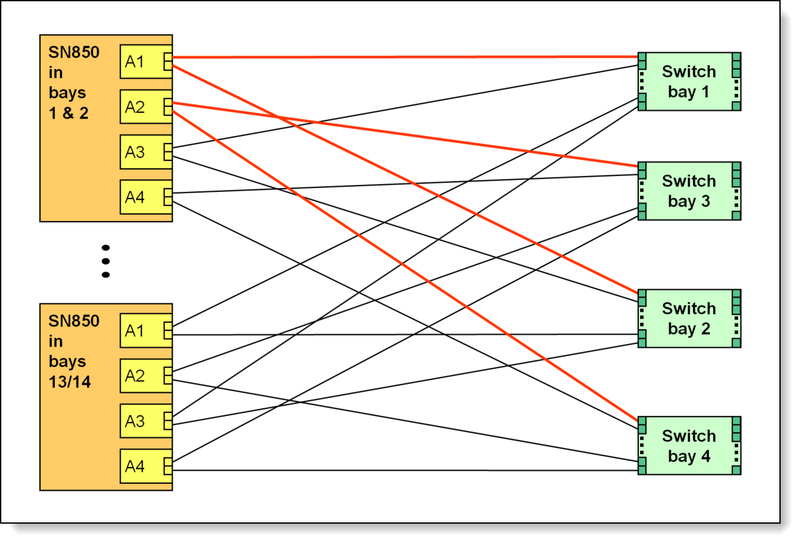 When four processors are installed, they are connected in the Mesh topology to maximize inter-processor communication (requires processors with three UPI connections). Depending on the processor model installed, the processors are connected together using either two or three UPI links. Processors with a T suffix are those that have more robust thermal characteristics (higher T-case). Processors with an M suffix support support greater than 768 GB per processor. Note: The SN850 processor part numbers listed include two processors. † Only available as a special order. Please contact your Lenovo representative for details. The SN850 uses Lenovo TruDDR4 memory operating at speeds up to 2666 MHz. TruDDR4 Memory uses the highest quality components that are sourced from Tier 1 DRAM suppliers and only memory that meets the strict requirements of Lenovo is selected. It is compatibility tested and tuned on every ThinkSystem server to maximize performance and reliability. 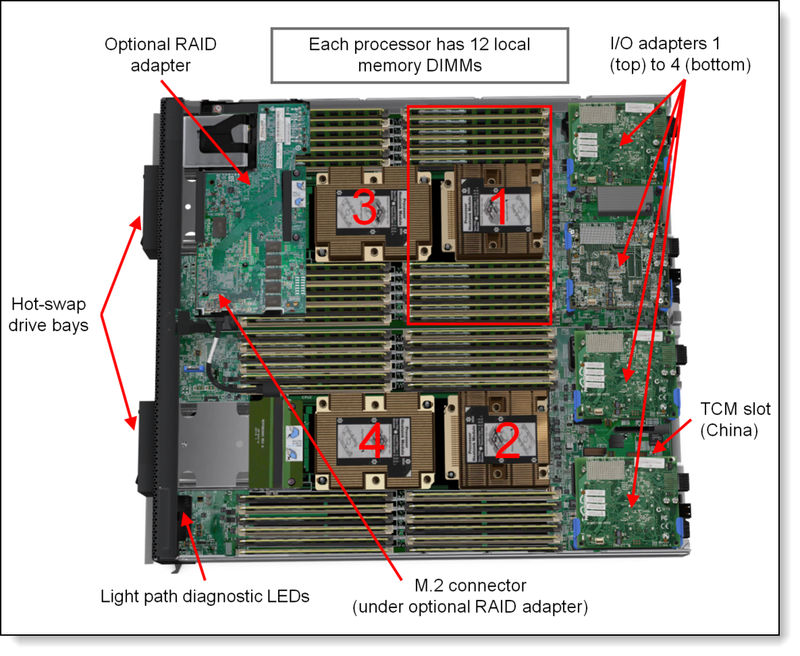 TruDDR4 Memory has a unique signature that is programmed into the DIMM that enables ThinkSystem servers to verify whether the memory that is installed is qualified and supported by Lenovo. From a service and support standpoint, Lenovo TruDDR4 memory automatically assumes the Lenovo system warranty and Lenovo provides service and support worldwide. All DIMMs operate at a speed of 2666 MHz, both at 1 DIMM per channel and 2 DIMMs per channel. However, if the processor selected has a lower memory bus speed (eg 2400 MHz), then all DIMMs will operate at that lower speed. The following table lists the memory options that are available for the SN850 server. The server supports RDIMMs, LRDIMMs and 3DS RDIMMs. UDIMMs are not supported. 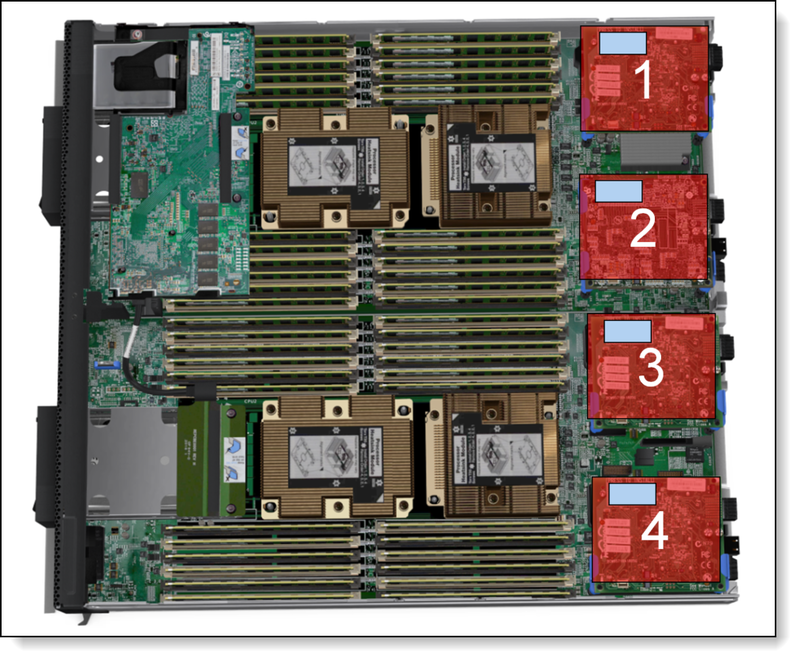 The SN850 server has four 2.5-inch hot-swap drive bays that are accessible from the front of the blade server (see Figure 2). Depending on server configuration and installed backplanes, these bays connect to either the integrated 6 Gbps SATA controller, optional Lenovo RAID controllers or directly to PCIe lanes for NVMe drives. Virtualization support: The integrated SATA controller can be used with virtualization hypervisors, including VMware ESXi, Linux KVM, Xen, and Microsoft Hyper-V. However, support is limited to AHCI (non-RAID) mode. RSTe mode is not supported with virtualization hypervisors. Storage backplane kits, RAID and M.2 upgrades are listed below. In addition to the optional M.2 RAID-1 enabled adapter, the SN850 supports 3 different RAID controllers as shown in the table below. Both the 530-4i and 930-4i replace the onboard SATA controller in the server and support high-performance RAID to the four internal 2.5-inch drive bays. 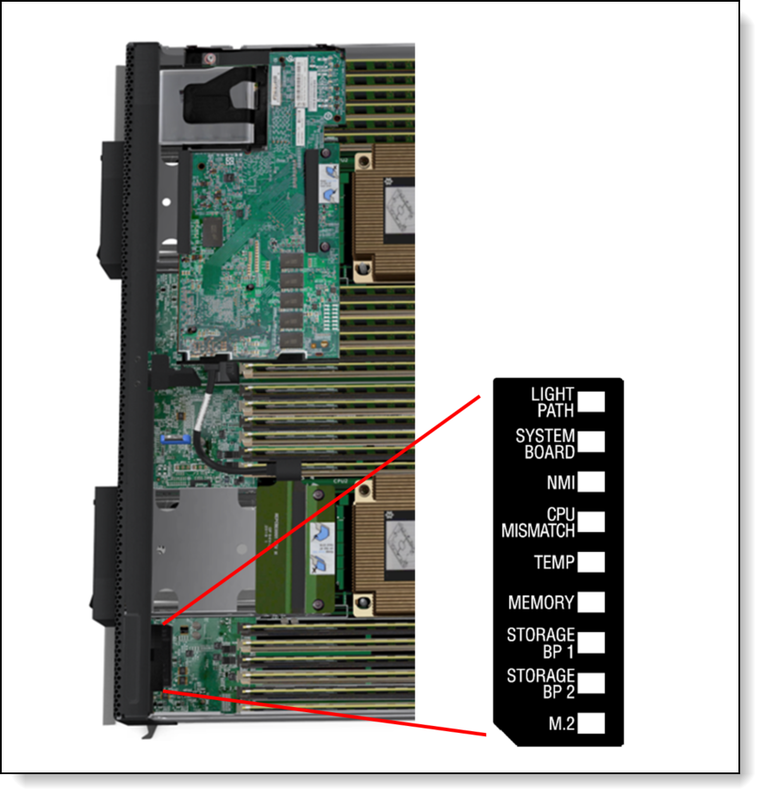 The following figure shows the ThinkSystem RAID 530-4i adapter for the SN850 blade server. Note that the plastic frame in the lower right of the adapter is part of the mechanism that attaches the adapter to the server; this adapter does not support a supercapacitor. The server supports booting from a hypervisor installed on an M.2 solid-state drive. See the M.2 drives section for details and the list of available options. VMware ESXi is available as a factory installed option for M.2 drives. Feature codes are listed below. The server does not support an internal tape drive. However, it can be attached to external tape drives by using Fibre Channel connectivity. The server does not support an internal optical drive option, however, you can connect an external USB optical drive. See https://datacentersupport.lenovo.com/us/en/documents/pd011281 for information about available external optical drives from Lenovo. Alternatively, use the remote media feature of the XClarity Controller and the Chassis Management Module. The SN850 includes an embedded 4-port 10Gb Intel controller built into the system board. As listed in the Models section, some SN850 models include the Fabric Connector needed to connect the embedded controller to the midplane of the Flex System chassis. For models that do not include the Fabric Connector, it can be ordered and installed in the field. Ordering information is listed in the following table. The location of the fabric connector is shown below. Table 25 and Figure 9 show how the 4 ports of the embedded controller connect through the Fabric Connector to the corresponding I/O module ports. The Fabric Connector can be removed, if required, to allow the installation of an I/O adapter on I/O connector 3. 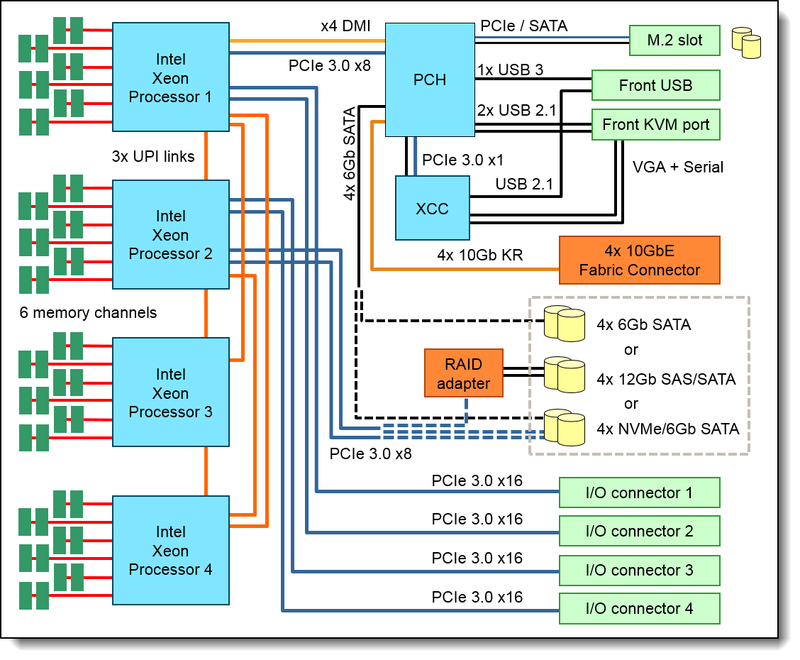 The embedded 10Gb controller is based on the Intel Ethernet Connection X722 network controller which is part of the Intel C624 "Lewisburg" PCH chipset of the SN850 and other Lenovo ThinkSystem servers. VXLAN/NVGRE Hardware Offloads: These stateless offloads preserve application performance for overlay networks. With these offloads, it is possible to distribute network traffic across CPU cores. At the same time, the controller offloads LSO, GSO, and checksum from the host software, which reduces CPU overhead. Low latency: Intel Ethernet Flow Director delivers hardware-based application steering and Intel Data Direct I/O makes the processor cache the primary destination and source of I/O data rather than main memory. Virtualization performance: With Intel Virtualization Technology (VT), the controller delivers outstanding I/O performance in virtualized server environments. The controller reduces I/O bottlenecks by providing intelligent offloads for networking traffic per virtual machine (VM), which enables near-line rate speeds for small packets and supports almost an unlimited amount of isolated traffic flows so that you can scale your cloud environment. Next-generation VMDq: The controller supports up to 128 VMDq VMs and offers enhanced Quality of Service (QoS) by providing weighted round-robin servicing for the Tx data. The controller offloads the data-sorting functionality from the hypervisor to the network silicon, which improves data throughput and CPU usage. SR-IOV implementation: Provides an implementation of the PCI-SIG standard for I/O Virtualization. The physical configuration of each port is divided into multiple virtual ports. Each virtual port is assigned to an individual VM directly by bypassing the virtual switch in the Hypervisor, which results in near-native performance. VM load balancing: Provides traffic load balancing (Tx and Rx) across VMs that are bound to the team interface. It also provides fault tolerance if a switch, port, or cable fails or is disconnected. Auto-detect (PnP) feature for the LOM adapters, enabling you to change speed (eg from a 1Gb LOM to 10 Gb LOM) and the network interface will automatically reconfigure during the boot process. Note: The onboard Ethernet controller does not support 10 Mb or 100 Mb Ethernet connections. The SN850 has four I/O expansion connectors for attaching I/O adapter cards. The I/O expansion connectors use a high-density, 216-pin PCIe connection. Installing I/O adapter cards allows the server to connect with I/O modules in the chassis. Each slot has a PCI Express 3.0 x16 host interface and all slots support the same form-factor adapters. The following figure shows the location of the I/O expansion connectors. All I/O adapters are the same form factor. A compatible switch or pass-through module must be installed in the corresponding I/O bays in the chassis, as indicated in the following table. Installing two switches means that all ports of the adapter are enabled, which improves performance and network availability. 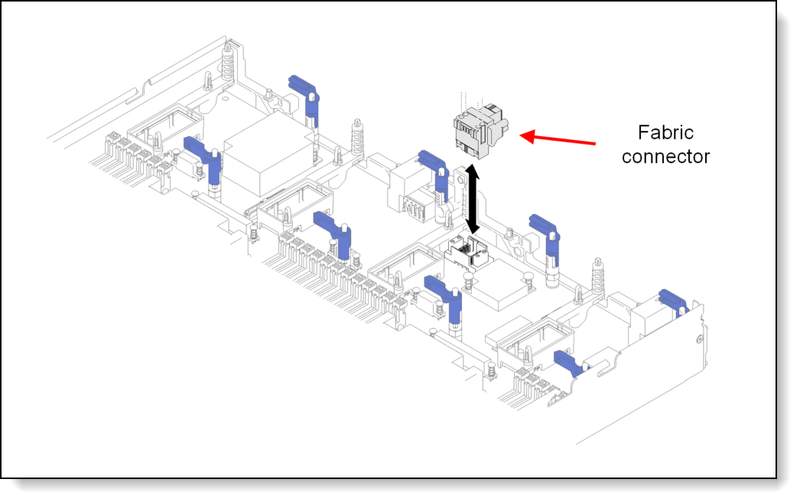 The following figure shows the location of the I/O module bays in the Flex System Enterprise Chassis. The following figure shows how two-port adapters are connected to switches that are installed in the chassis. In addition to the embedded Intel 4-port 10Gb controller (model specific), the SN850 supports other network adapters that can be installed in IO slots. The following table lists the supported network adapters and upgrades. Adapters can be installed in any slot. However, compatible switches must be installed in the corresponding bays of the chassis. FCoE and iSCSI support: ThinkSystem server adapters do not support Features on Demand, so the CN4052S and CN4054S 2-port 10Gb basic adapters cannot be upgraded to FCoE support. If you need FCoE or iSCSI support use the 01CV780 or 01CV790 adapters. The following table lists storage Host Bus Adapters (HBAs) that are supported by the SN850. Storage HBAs are supported in all slots, however for CTO orders, the HBAs are installed only in slots 2 and 4. Power to the blade server is derived from the power supplies that are installed in the chassis. There are no server options regarding power supplies. As shown in Figure 2, the SN850 front panel includes a USB port, status indicators, a button to enable management via the USB port and a console breakout cable port. The breakout cable (supplied with the chassis) provides serial, video and a USB port for connecting a local console. The USB ports on the breakout cable support keyboard and mouse; storage devices are not supported. The Lenovo XClarity Mobile (LXCM) app now includes a tethering function where you can connect your Android or iOS device to the server via USB to see the status of the server. Enable USB Management on the server, by pressing and holding for 3 seconds the dedicated USB management button on the front of the server. The SN850 includes light path diagnostics. If an environmental condition exceeds a threshold or if a system component fails, XCC lights LEDs inside the server to help you diagnose the problem and find the failing part. Illuminate the Fault LED on the front panel. Identify the fault in the light path diagnostics panel, as shown in the following figure. If a DIMM is faulty, the LED next to it is illuminated. The SN850 light path diagnostics panel is inside the server near the front panel, as shown in the following figure. To illuminate the light path diagnostics LEDs, power off the server, slide it out of the chassis, and press and hold the power button. The power button doubles as the light path diagnostics reminder button when the server is removed from the chassis. The meanings of the LEDs in the light path diagnostics panel are listed in the following table. LIGHT PATH The light path diagnostics panel is operational. SYSTEM BOARD A system board error is detected. NMI A non-maskable interrupt (NMI) occurred. CPU MISMATCH The processors are mismatched. TEMP An over-temperature condition occurred that was critical enough to shut down the server. MEMORY A memory fault occurred. The corresponding DIMM error LEDs on the system board are also lit. STORAGE BP 1 A hard disk drive backplane error has occurred. M.2 A M.2 backplane error has occurred. The front of the server also houses an information pull-out tab. See Figure 2 for the location. A label on the tab shows the network information (MAC address and other data) to remotely access XClarity Controller. Lenovo XClarity Controller (XCC) is an embedded management engine common in every ThinkSystem server. Command-line interface. To access the CLI interface, use SSH to log in to the management processor. Web-based interface. To access the web-based interface, point your browser to the IP address for the management processor. The intuitive interface includes at-a-glance visualizations and simple access to common system actions. The dashboard is shown in the following figure. Lenovo XClarity Energy Manager (LXEM) is an agent-less, web-based console that provides power management for ThinkServer, System x and ThinkSystem servers. It enables server density and data center capacity to be increased through the use of power capping. The TCM and TPM plugin modules, available only for China customers, are installed in a dedicated socket on the system board, as shown in Figure 3. Ordering information is shown in the following table. * Available configure-to-order or pre-configured models only; Not available as a field upgrade. The Lenovo ThinkSystem SN850 server complies with ASHRAE Class A3 specifications. System performance may be impacted when operating temperature is above ASHRAE A3 specification or fan failed condition. The ThinkSystem SN850 (machine type 7X15) has a 3-year warranty.